The independent expert, Grant Samuel & Associates, says that the proposal to internalize DUET's management is fair and reasonable and in the best interests of non associated security holders. GWA Group's shares touched a three year low of $1.69 on 5 October. On 11 October Hastings Diversified Utilities Fund's securities touched a three year high of $2.72. The Fund issued 30,323,086 securities at $2.615 each to its responsible entity as payment for incentive fees for the six month periods to 31 December 2011 and 30 June 2012. Tassal managing director and chief executive officer Mark Ryan said the decision by Federal Minister for Sustainability and Environment, Tony Burke, to allow for the multi million dollar expansion of the salmon industry in Macquarie Harbour on the west coast of Tasmania, is good news for the fast growing sustainable food sector, the west coast and the state. Mr Ryan said Tassal has achieved strong growth over the past five years while maintaining a strong commitment to the environment and sustainable practices. "Tassal has a focused and long term strategy to further develop our business that is underpinned by sustainable practices," he said. "Our plans to expand on the west coast are an important part of this overall strategy. Through operating a clear and transparent consultation process, Tassal has clearly demonstrated that we continue to work with any environmental or community group that wants to work with us." Mr Ryan said the industry had worked closely with the Tasmanian Government and the West Coast Council for the past two years to explore opportunities for expansion in Macquarie Harbour. Lonsec has maintained its Recommended rating for the Australian Ethical Smaller Companies Trust. The rating means Lonsec has "conviction that the Smaller Companies Trust can achieve its objectives and outperform peers over an appropriate investment timeframe." The Trust achieved a return of 22 per cent for the year to 30 September and 10.3 per cent over 10 years, beating its benchmark, the S&P/ASX Small Industrials as well as the S&P/ASX 200 Index. The Trust combines a motivated portfolio manager and a high conviction approach, said Lonsec, which also retained the trust's investment grade rating when it reviewed the responsible investment sector. Infigen remains conscious that its debt burden inhibits its capacity to pay distributions and make additional major investments, says chairman Mike Hutchinson in the company's annual report. The net debt under the Global Facility was $997 million at 30 June, and if operating conditions go as planned Infigen expects to pay off another $55 million this year. "As the Global Facility remains in cash sweep, our focus will be on sustaining surplus operating cash flow to maximize debt repayment,' said Mr Hutchinson. Managing director, Miles George, writes that production in the US and Australia is expected to improve on the 2011-12 outcome. Prices could also rise. "There are a number of factors that are expected to lead to upward pressure on wholesale electricity prices in the medium to long term. These include reduced investment in new electricity generation capacity and continuing retirement of ageing coal fired power stations in the US, and liquefied natural gas (LNG) projects coming on line in Australia. The prospects for LNG export opportunities are expected to lift domestic gas prices towards much higher export parity prices." August Investments said the change in fortunes for green equities it hinted at previously gathered pace in the September Quarter with its portfolio up by 8.4 per cent and the Australian CleanTech Index up 8.3 per cent and for the quarter. 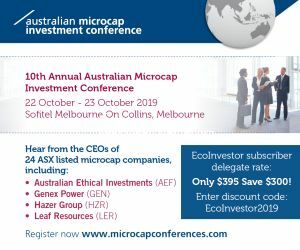 "Our universe of green equities has diminished since we moved away from the more speculative green investments and any company associated with coal seam gas (Origin Energy etc)," said managing director, Damien Lynch. "Instead we have invested more in value dividend paying equities which are ethically 'neutral'. These include M2 Telecommunications, Technology One (computer services) and McMillan Shakespeare (Employment services). "We remain on the outlook for green investments which also provide value for investors." Aeris Environmental has issued 9,150,000 shares on conversion of convertible notes and 559,700 shares as interest owing on convertible notes at 20 cents each. Vmoto has raised £1.56 million or about $2.4 million through a placement of shares with UK institutions and sophisticated investors at 1.3 pence or 2 cents per share. The company said the fundraising is in conjunction with its proposed dual listing on AIM, and it expects its entire share capital including the placement shares be admitted to AIM on 9 November. The placement is to meet its current order book including the PowerEagle Strategic Cooperation agreement, expand its product range, expand its distribution base, increase its workforce, improve quality control and after sales service, and complete the fit out of Stage 2 of its manufacturing facility in Nanjing, China. finnCap acted as the nominated adviser and broker on AIM. Following the capital raising, Blair Sergeant has resigned as non executive director to focus on his external commitments with Lemur Resources. Lynas Corporation saw its share price fall on news that the Kuantan High Court has reserved its decision on an application by the Save Malaysia Stop Lynas (SMSL) group who are seeking an injunction against Lynas' Temporary Operating Licence (TOL). The SMSL wants a judicial review of the Minister of Innovation, Science and Technology's decision to dismiss an appeal against the award of the TOL. Greenpark Energy has been given a 9.85 per cent interest in Dart Energy as part of Dart's 2011 purchase of Greenpark Energy's unconventional gas assets for $42 million payable in two tranches. The second US$21 million tranche was payable on 30 September. As Dart Energy International was not listed, Dart Energy has chosen to pay a mixture of cash and shares. It will issue Greenpark with up to 110.8 million shares with 43.4 million issued immediately and the balance after approval at the annual general meeting. Greenpark could end up holding up to 16 per cent of Dart. Galaxy Resources said it has successfully completed a long term pumping test on the first proposed production well at the Sal de Vida lithium and potash brine project in Argentina. The test involved pumping brine from the production well at a constant rate and without faults or blockages over a 30 day period. Pumping brine to solar ponds is a critical part of a lithium brine operation. When the brine evaporates, the concentrated lithium brine is harvested and processed into lithium carbonate. GMP Securities Australia has become the sixth broker to cover Orocobre. The others are Patersons Securities Limited, Cormark Securities Inc, Dundee Securities Ltd, Byron Capital Markets Ltd, and Stifel Nicolaus Canada Inc.
Shares in AnaeCo fell to a new all time low of 3 cents on 9 October. The company received a letter from the ASX querying its $20 million loss for 2011-12 and limited cash. Blue Energy chairman, Peter Cockcroft has stood down due to personal circumstances and will retire from the board on 31 December. The company is looking for a replacement as chairman. In the meantime John Ellice Flint will act as interim chairman of the Board and Rodney Cameron has been appointed deputy chairman. SPTS has increased its interest in BluGlass from 19.9 to 24.9 per cent following the issue of shares as consideration for the sale of its 49 per cent of their EpiBlu joint venture to BluGlass. Carnegie Wave Energy expects to receive about $1.1 million in coming weeks under the Federal Government's new Research and Development Tax Incentive. The new legislation provides annual cash refunds of 45 per cent on qualifying R&D expenditure. Island Sky Australia has completed the sale of a 75 per cent interest in its subsidiary, Island Sky Corporation Inc (ISC), to director Richard Grodon under the agreement approved by shareholders in July. The $100,000 deposit from Mr Groden has been received. The balance of the purchase price, $1,054,929, is to be paid within two years and is secured by an interest over the acquired shares. Island Sky retains 25 per cent of ISC, which holds the intellectual property rights to develop and market air to water machines. Following its 26 September announcement that it would cease further spending on the Cummins Range light rare earths project, Kimberley Rare Earths has reached agreement with joint venture partner Navigator Resources (NAV) to terminate the Joint Venture Agreement (JVA) and transfer its 25 per cent interest in Cummins Range back to NAV. Consideration is $350,000 by KRE to NAV. The move reduces KRE's expenditure commitments by $6.8 million. "It should be no surprise to any of us that the geothermal sector for Australian companies remains extremely challenging," KUTh Energy chairman Bruce McKay told the annual general meeting. "Regrettably for shareholders, it is evidenced by languishing share prices for KUTh and all our peers. To be totally transparent, KUTh's share price on the last trading day in June 2012 was 2.2 cents compared to 5.1 cents one year earlier: without naming names, other companies have seen reductions from over 30 cents to about 12 cents; 12 cents to 4½ cents and 3 cents to less than 1 cent. "This reflects that Australian projects have been difficult to prove the "hot rock" concept not only technically but absolutely commercially: they remain very expensive to evaluate and develop and adequate funding sources are simply not available. "One of our peer companies has stated clearly that it has no intention to commit any funds to its Australian assets unless there is a substantial commitment of funding from the Australian government towards developing Australia's significant geothermal resources," he said. KUTH's Tasmanian project at a drill ready stage but awaiting capital, and the company continues to focus on the Pacific Islands, with its priorities Vanuatu and Fiji. Lithex Resources is aiming to raise up to $1,688,525 via a placement and a non renounceable entitlement issue. The issue price is 5 cents per share. Every two new shares will have one free attaching option. The placement will be conducted by Cunningham Paterson Sharbanee Securities Pty Ltd or CPS Securities, which has also underwritten the $1,339,175 non renounceable pro rata entitlement issue. Metgasco has appointed CNC Project Management (CNC) and OSD Pipelines (OSD) to provide engineering, environmental and regulatory services to help it obtain a further production lease to support gas sales in the Northern Rivers area of NSW. CNC will provide regulatory and environmental expertise and OSD will provide engineering support. Managing director, Peter Henderson, said "Metgasco is pursuing a range of local domestic sales, with pipeline sales to the Richmond Dairies and other Casino businesses, compressed natural gas and micro LNG supplies to Northern River's industries and power generation sales. CNC and OSD will provide important assistance in preparing the range of environmental submissions and engineering plans to support development approvals and production licence applications. "We have identified local market opportunities in the range of 5 to 10 petajoules per annum. These local gas sales are a key part of our initial growth strategy and should help local business by providing energy that has a lower and more stable cost than imported fuels. Papyrus Australia has signed a $250,000 draw down loan facility with Talisker Pty Ltd, a company owned by Papyrus Australia managing director and major shareholder Ramy Azer and his wife Phoebe Azer. The loan is unsecured and will be repayable from future revenues or from the proceeds of any future equity raisings and subject to not materially prejudicing the company's ability to repay its creditors. The loan is a related party transaction but is considered to be on terms that are fair and reasonable to the company and significantly more favourable than available from any arms length financier, said Papyrus. On 11 October Petratherm's shares fell to a new all time low of 2.7 cents.